Today, 2 March, an article with novel findings regarding the processes underlying Alzheimer's disease was published in the journal Neuron. Shared first author of the article is Michael Schöll from MedTech West and the University of Gothenburg. Michael spent last year as a scholar at the University of California, Berkeley, working with a research group under the lead of professor William Jagust, and the collaboration is continuing after his return to Gothenburg. This groundbreaking new research shows for the first time that PET scans can track the progressive stages of Alzheimer’s disease in cognitively normal adults, a key advance in the early diagnosis and staging of the neurodegenerative disorder. In the process, the scientists also obtained important clues about two Alzheimer’s-linked proteins – tau and beta-amyloid – and how they relate to each other. The findings come from positron emission tomography (PET) of 53 adults. Five were young adults aged 20-26, 33 were cognitively healthy adults aged 64-90, and 15 were patients aged 53-77 who had been diagnosed with probable Alzheimer’s dementia. The stages of tau deposition were established by German researchers Heiko and Eva Braak through post-mortem analysis of the brains of suspected Alzheimer’s patients. - Braak staging was developed through data obtained from autopsies, but our study is the first to show the staging in people who are not only alive, but who have no signs of cognitive impairment, said study principal investigator Dr. William Jagust, a professor at UC Berkeley’s School of Public Health and at the Helen Wills Neuroscience Institute, and a faculty scientist at the Lawrence Berkeley National Laboratory. This opens the door to the use of PET scans as a diagnostic and staging tool. PET scans are used to detect early signs of disease by looking at cellular-level changes in organs and tissue. The results of the scans in this study paralleled Braak neuropathological stages, which range from one to six, describing the degree of tau protein accumulation in the brain. 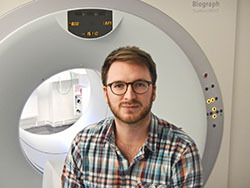 Jagust worked with study co-lead authors Michael Schöll from MedTech West, and Samuel Lockhart, a postdoctoral fellow, both at UC Berkeley’s Helen Wills Neuroscience Institute. Their findings also shed light on the nature of tau and amyloid protein deposits in the aging brain. For many years, the accumulation of beta amyloid plaques was considered the primary culprit in Alzheimer’s disease. Over the past decade, however, tau, a microtubule protein important in maintaining the structure of neurons, has emerged as a major player. When the tau protein gets tangled and twisted, its ability to support synaptic connections becomes impaired. While a number of symptoms exist that signal Alzheimer’s disease, a definitive diagnosis has been possible only through an examination of the brain after the patient has died. The availability of amyloid imaging for the past decade has improved this situation, but how Alzheimer’s developed as a result of amyloid remains a mystery. Studies done in autopsies linked the development of symptoms to the deposition of the tau protein. Through the PET scans, the researchers confirmed that with advancing age, tau protein accumulated in the medial temporal lobe – home to the hippocampus and the memory center of the brain. - Tau is basically present in almost every aging brain, said Schöll. Very few old people have no tau. In our case, it seems like the accumulation of tau in the medial temporal lobe was independent of amyloid and driven by age. - It’s not that one is more important than the other, said Lockhart. Our study suggests that they may work together in the progression of Alzheimer’s. - Amyloid may somehow facilitate the spread of tau, or tau may initiate the deposition of amyloid. We don't know. We can't answer that at this point, said Jagust. All I can say is that when amyloid starts to show up, we start to see tau in other parts of the brain, and that is when real problems begin. We think that may be the beginning of symptomatic Alzheimer’s disease. The article, PET Imaging of Tau Deposition in the Aging Human Brain was published in Neuron journal on 2 March, 2016.